I like this - very moody. I like that Cheryl. Timed for a very nice composition. Thankyou for the comments, Kate, Polly and John. I tried photographing the thistle flower outside on the plant but gave up pretty quickly - standing on the edge of dam bank amongst head high scotch thistles not comfy - and took some of the flowers indoors. 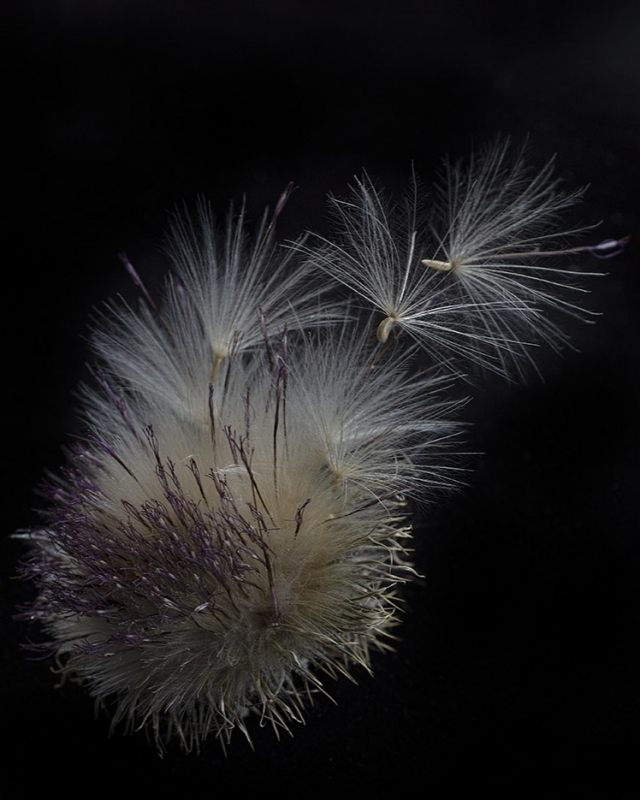 I set one up on a piece of black suede and arranged the seed heads to creat the image. Shot it using spot metering to get the flower lighter and the BG black. I think the image is a bit too dark and intend to try again. Like the ibis feather photo on black BG that I posted a while back, I want to shoot some on a white background also. I think you suggested this, John, which was helpful. More than happy for your suggestions. I agree pretty much with all that's been said - a lovely image! Perhaps the image is a little dark, bu If you're working in Photoshop a curves adjustment layer to lift the whites a tad would work wonders. Thank you Korky, I’ll give your suggestion a go. If you do Cheryl ...post the new version as opposed to editing the first pic ... just to make sure the thread still makes sense chronologically ...lol. I think his Lordship is right ... it could make a big difference .